Social media marketing firm ViralMint rolled out a new feature that proved so popular that the increased customer traffic swamped the capabilities of the existing load balancer solution and greatly increased application response times. Lacking visibility into the volume or nature of its traffic, ViralMint had no clues for how to address its issues. 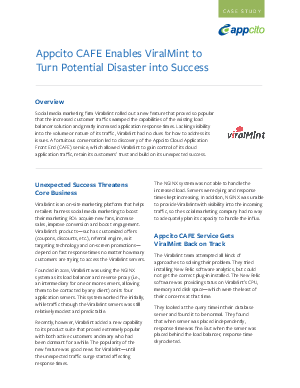 A fortuitous conversation led to discovery of the Appcito Cloud Application Front End (CAFE) service, which allowed ViralMint to gain control of its cloud application traffic, retain its customers’ trust and build on its unexpected success.